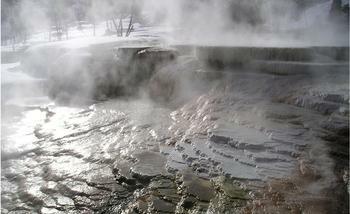 Biogeochemical methods have been employed at Yellowstone National Park. Image of terraced carbonate architecture at Mammoth Hot Springs (picture taken by Bruce Fouke, 2006). Biogeochemistry integrates several disciplines, including biology, geology, geography, and chemistry. Biogeochemical studies can be diverse and may include topics such as nutrient cycling, biotic and abiotic weathering processes, carbon cycling, microbiological-macrobiological interactions, among others. The world is complex and Earth systems do not work independently of one another; that is, the biotic world is inherantly tied to the abiotic world. Therefore, a more wholistic understanding of the Earth system can be achieved by integrating biological, geological, and geographic studies, among others.